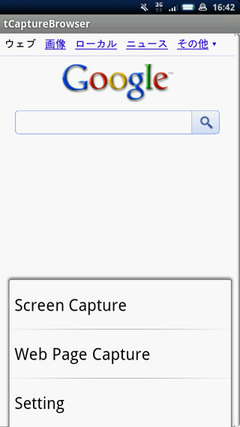 "tCaptureBrowser" allows you to browse with free user agent, and capture screens. Many web page creators face with the need of changing agent names for the test or the need of capturing web page to make the documentations. Some bloggers will capture pages too. 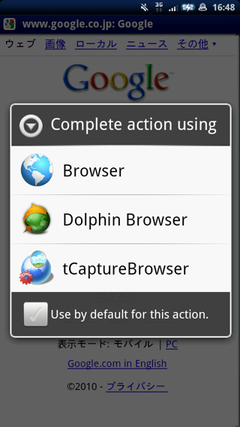 "tCaptureBrowser" reduces such works of creating web pages. It has two capturing methods, [ Web Page Capture ] gets all web page, [ Screen Capture ] gets what watching on display. So you can choose better method at capturing sheen. Setting user agent allows you to browse with emulating some devices and you can check display of web page related to specific devices. 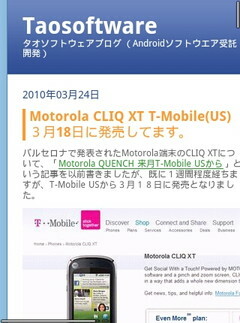 Preinstalled user agents are one of sell phone, HT-03A, iPhone, and XPERIA. Of course, you can add user agent after install. This browser shares "bookmark" with default browser of Android. When you use another browser and face with a page needed capture, bookmark for now page. After when capturing with tCaptureBrowser, you easily jump to the page. There is two methods to capture pages. And settings of compression binded with caputuring functions reduces file size. Particularly, images of made by Web Page Capture can be large, so choice row resolution in the case. 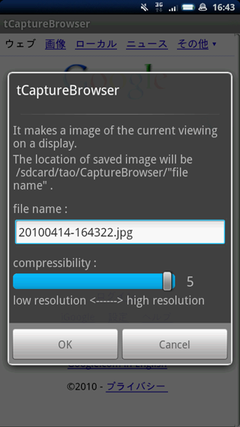 Screen Capture saves current showing just on a display to a file. The size of next image file that was captured on highest resolution is about 100KB. Web Page Capture saves whole current page that contains invisible area on a display. Next image is captured by Web Page Capture at same state of previous one. This image is reduced for easily viewable whole image. The size of this image captured with highest resolution is about 2.3MB. Choosing "menu"->"More"->"Screen Capture"(or "Web Page Capture") displays setting dialog for capturing image file. Clicking "OK" make web page saved as image file. You can conform the completion of capturing by looking to showing on a display. Choosing "menu"->"More"->"Settings" shows settings page. 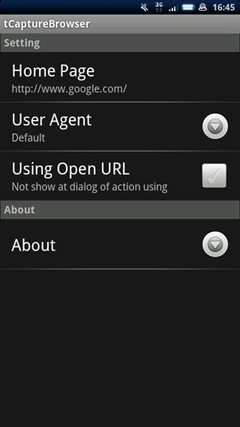 Click "User Agent" and choose using agent at showed list. Then the step of changing user agent is finish. 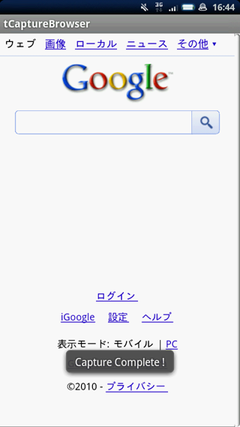 If want to add a user agent, push "menu" and click showed icon to move page of adding user agents. When no check "Using Open URL", tCaptureBrowser doesn't join the list of action using dialog which is shown up by clicking URL. 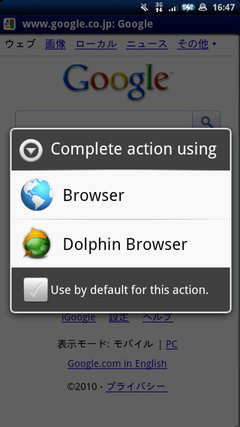 When check "Using Open URL", tCaptureBrowser join the list of action using dialog. Large size pages are not captured, the reason is an image size will be too large to capture. And active pages such as having a telop are sometimes not captured too. These pages are infrequently captured, but please note that it is impossible to capture all pages because of the restriction of Android OS and Android Browser. 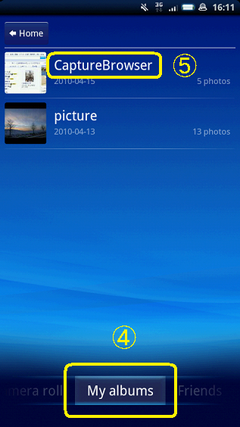 Captured images are saved at sdcard, so easily checking images to use a file-explore. 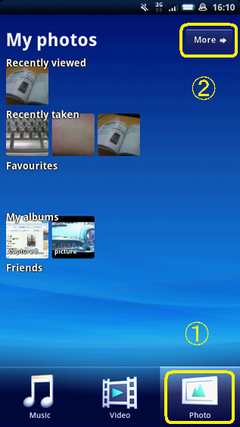 Here, showing how to confirm captured images with "Mediascape" that is pre-installed on Xperia. There are captured images in the folder.